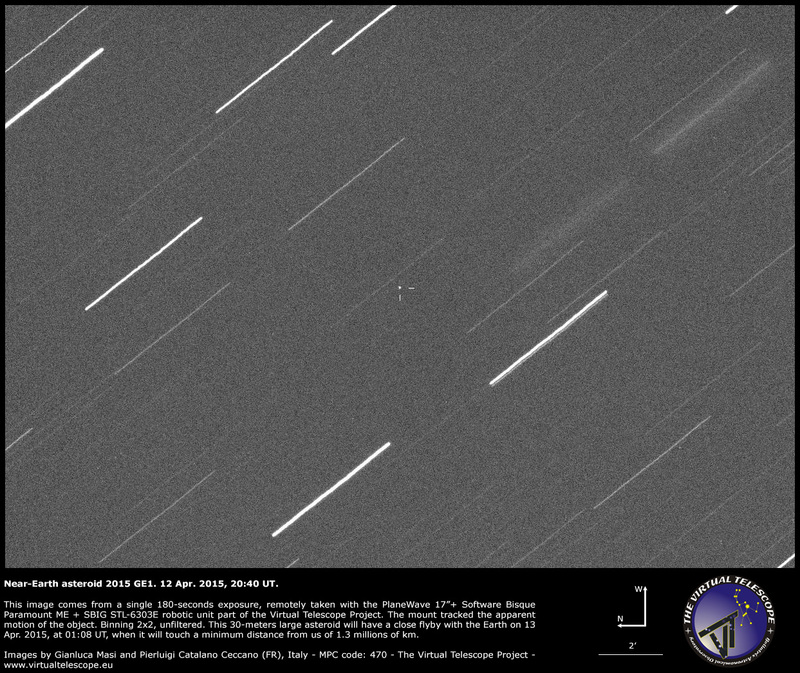 On 13 April 2015, a few hours before 2015GK, the near-Earth asteroid 2015 GE1 had a very close encounter with our planet. With an estimated diameter of ~30 meters, at 01:08 UT this asteroid asteroid reached a minimum distance from us of about 1.3 millions of km, that is 3.4 times the mean distance of the Moon. Of course, there were not risks of collisions at all. The image above is a single 180-seconds exposures, remotely taken with the PlaneWave 17 robotic unit part of the Virtual Telescope. The robotic mount tracked the fast apparent motion of the asteroid, so stars are trailing, while the asteroid is perfectly tracked.